Sub: DSE - Learning Enhancement Programme - Conduct of Learning Enhancement Programme to the students of KGBVs and High Schools (Upper Primary Sections) in all the districts to improve the basic competencies of Reading, writing and arithmetic - Regarding. All the Regional Joint Directors of School Education and District Educational Officers and Ex-Officio Project Officers of SSA are hereby informed that vide reference cited, detailed programme of learning enhancement to be conducted in all the KGBVs except where KGBVs are running in rented accommodation from 03.04.2017 to 22.04.2017 have been communicated to all the District Collectors and a copy to District Educational Officers and Ex-Officio Project Officers of SSA for planning and implementation of the programme. 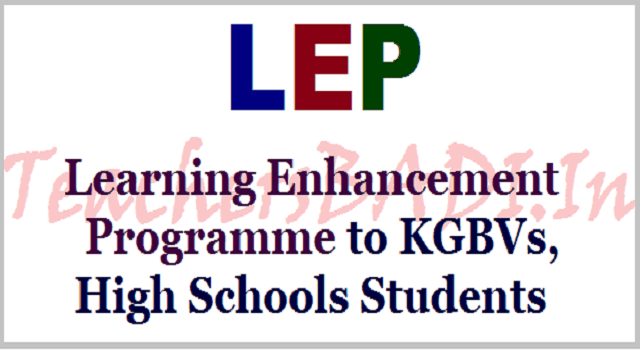 Following are the further guidelines for the implementation of learning enhancement programme. It is proposed for the conduct of learning enhancement programme for all the students of KGBVs i.e., 150 students and 150 girl children may be involved from nearby Government I Local Body Schools. The programme is proposed for 21 days i.e., from 3rd to 22nd April 2017 in all the KGBVs except KGBVs without buildings. • Fluent reading and reading comprehension. • Writing- own writing on any given topic I issue. • Special discussions, debates on contemporary and social issues for the empowerment of girl students. SO will be overall incharge of the programme. In this regard, the Vandematharam Foundation will be requested to extend technical support and act as facilitator to conduct of the programmes without any monitary commitment. In case of Kamareddy District, My Village Model Village Foundation will provide technical support. The training details are given hereunder. Therefore all the District Educational Officers and Ex-Officio POs of SSA are requested to take up immediate necessary action on the following action points. • Information to all the Special Officers of KGBVs to start the programme from 03.04.2017 onwards for 21 days i.e., upto 22.04.2017. Duly involving all the existing KGBV children i.e., about 150. • Instructions to the Head Masters of nearby High Schools to send 15 girl children with consent of parents from classes VII, VIII & IX to a total of 150 so that the camp will be conducted for 300 children. The children are given information to get bed sheets and other items to the camp as per the list enclosed to this proceedings. • Instructions to the SOs of KGBVs to attend the training programme on 27th and 28th at Transit Point Bhongir and also depute CRTs to the training on the dates as mentioned above. The maths work sheets and other assessment papers for the children in the camp will be handed over to the Special Officers and also maths teachers to take back to the KGBVs for use. • The Special Officer will be the incharge for conduct of the camps. The District Educational Officer will be overall incharge of all the camps. The Nodal Officer and Sectoral Officers of SSA will monitor and supervise and visit the camps on daily basis and see that the programme will be conducted effectively. • The expenditure towards conduct of the camp will be released to the District Educational Officers and Ex-Officio Project Officer of SSA and they in turn release to the PO, KGBVs for providing food and other things as per the existing rates of KGBVs in vogue and also procedures for procurement being in vogue. • Instructions to the Mandal Educational Officers to borrow the library books from nearby primary, Upper Primary and High Schools and continuous education centres of Adult Education to the KGBV for the purpose of reading and return the same to the schools after completion of the camp. The District Sectoral Officer and Nodal Officer shall monitor this. • The District Educational Officer shall convene a meeting with Special Officers of KGBVs and Head Masters of nearby High Schools to the KGBVs and discuss the guidelines and plan for the implementation, monitoring. • Mrs Subhashini, Incharge, KGBV (No.9849332080) at State office and Dr.N.Upender Reddy, Consultant at the office of C&DSE (No.9849909227) will be monitoring the programme i.e., both training and implementation from State level. The ASPD & SPD also visit the training centre and also some of the KGBVs during implementation of LEP. In this connection, it is proposed to train the SOs of KGBVs and other teachers for conduct of Learning Enhancement Programme. The training will be in a residential manner. The training venue will be at Transit Point & Suvali Estate, Bhongir, Yadadri District (3 Kms from Bhongir Bus stand towards Chityal I Valigonda Road). The Transit Point is on the way of Bhongir to Valigonda road i.e., one kilometer away from outer ring.road of Bhongir Town. The contact person is Mrs Vijay Lakshmi, Transit Point (No.9553085000) and Nodal Officer of Yadadri District Mr. Dasharatha Reddy (No.9849948264), M.Susheela, Sectoral Officer (No. 7995567539). The District Educational Officer, Yadadri (No. 7995087630) shall monitor the conduct of training programme and other facilities at training venue. Therefore, all the District Educational Office.rs are requested to take necessary immediate action and submit action taken report along with number of KGBVs with number of children i.e., KGBV wise shall be furnished to the C&DSE & Ex-Officio Project Officer, SSA by 03.04.2017 without fail. Further all the District Collectors are requested to review the programme and also visit the centres for effective monitoring and implementation of LEP. 1. Large amount of money; 2. Gold; 3. Mobile phones etc.